Steady Streams: Over a decade in the works, ACWA is about to make pilot testing history. Just two weeks before his interview with Water Canada and over a decade after the project’s initial planning phase, Dr. Leland Jackson proudly observed the first running test stream of the Advancing Canadian Wastewater Assets (ACWA) project. “We made a few adjustments, but what had been designed worked pretty well,” says the University of Calgary biology professor enthusiastically. The site is a researcher’s dream come true, but getting to this point hasn’t been easy. For a project that’s in the beginning stages of construction, ACWA already has a long, complicated history. After a full-scale design and a projected budget of $62 million, issues of funding and politics delayed the project for several years, causing the team to reevaluate. In February 2011, the Canadian Foundation for Innovation gave ACWA the $10.4 million stamp of approval, joining other project funders Alberta Advanced Education and Technology, the City of Calgary, the University of Calgary, and a $1-million in-kind contribution from scientific suppliers. Now, ACWA is operating under a budget of approximately $29.4 million. While an interdisciplinary team—ACWA boasts engineers and biologists—can have its benefits, it can also cause complications, making a big job of coordinating research themes. “We tend to think a little differently about solving problems,” Jackson admits. For example, new technologies can be evaluated over a relatively short period of time; however, it may take months to years to see changes in the organisms used to determine the ecosystem-level consequences. Despite the complications, however, Jackson sees the collaborative approach as a major plus. Translating the knowledge also poses a challenge. “We want to figure out how our results can be used to affect policy. Public education is also very important. 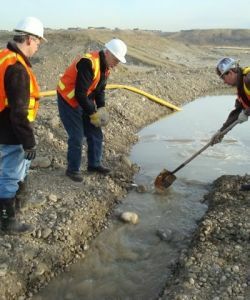 We’re working on a knowledge transfer strategy.” Jackson lists several partners, including the City of Calgary, the Canadian Water Network, and Environment Canada.